Palladium Fantasy RPG® 2E Paper Miniatures, Free Sample! These paper miniatures are designed to enhance your tabletop game play with some standard 28mm miniatures tailor made for the Palladium Fantasy RPG®. This sample pack includes four Gladiators (an Elf, a Dwarf, a Human and a Wolfen). 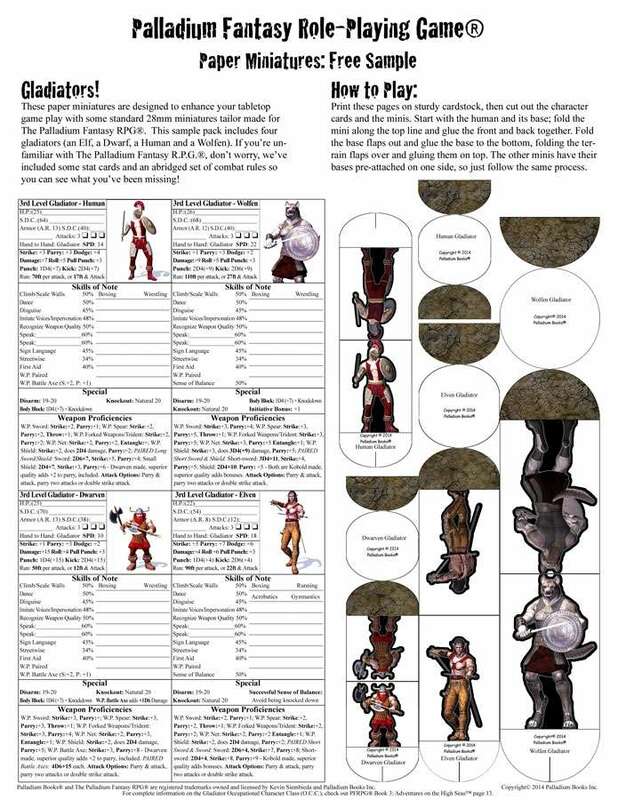 If you’re unfamiliar with the Palladium Fantasy RPG®, don’t worry, we’ve included some stat cards and an abridged set of combat rules so you can see what you’ve been missing! Suggested tools for assembly: a cutting board, a good hobby knife, and a glue stick or other form of adhesive.